Turn boring chords into fluttering melody lines with the RPG-8, Reason's tool for creative arpeggiation. 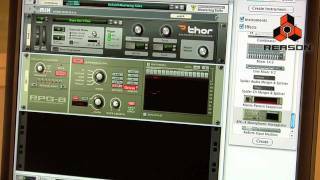 The RPG-8 Monophonic Arpeggiator is a unit dedicated to the art of arpeggiation. 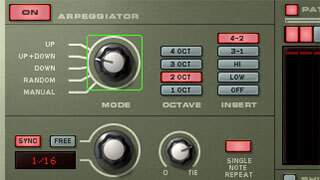 Some arpeggiators are quite content with simply transforming chords into wandering rhythmic melody lines. The RPG-8 monophonic arpeggiator is not. With a wide range of on-panel controls and mode selectors, a pattern section for muting selected notes in an arpeggio and a large display showing values and positions, this device gives you full creative control over your arpeggios. Although very hands-on and user friendly, the RPG-8 boasts some very advanced features under the surface. The 'Single Note Repeat' function engages the arpeggiator only when two or more simultaneous notes are held down - letting you add sudden bursts of arpeggio to your melody lines. The 'Manual' mode will arpeggiate notes strictly in the order they were input, for realtime arpeggio control. The RPG-8 monophonic arpeggiator is a creative workhorse that can - and should - be used with all of Reason's sound sources; try arpeggiating your breakbeats, your orchestra samples, or your ReCycled vocals.